See this article. 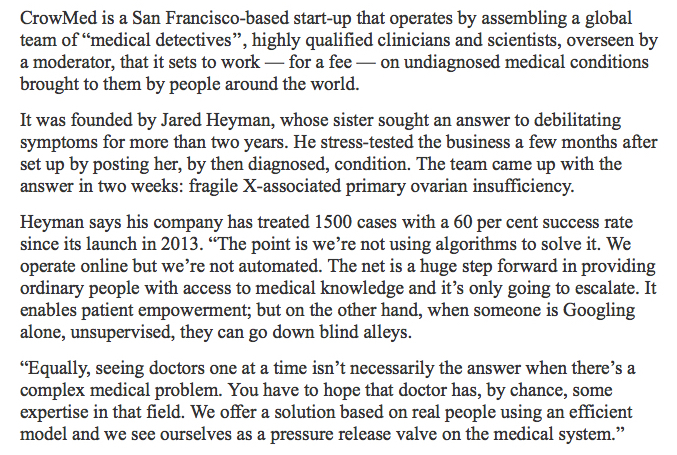 CrowdMed, (misspelt in the article,) could be of incredible interest to some. It has a website, and a Wikipedia article on it. We have not the slightest doubt about two things. Firstly, that despite this opposition, more and more organisations like Crowdmed will keep emerging all round the world. Secondly, that there will be more and more people with expertise in working with these organisations to assist patients to know exactly what’s wrong with them much more quickly, more accurately and more cheaply than happens at present – whether they will be doctors or others remains to be seen. Perhaps readers know of such people already? Of course, in the meantime, stories of tragic misdiagnoses abound. We’d love to hear from readers who have any feedback on these matters. This entry was posted in Modern diagnosis. Bookmark the permalink.